There's a battle, I believe, that happens in the mind of someone contemplating suicide — the battle between not wanting anyone to know and wanting desperately for someone to help you. For me, when I was struggling, I didn't want to tell anyone because I didn't want anyone to think I was weak. In college, there were times where I would hit myself in the thighs with weights. Part of the reason I did it was to numb what I was feeling inside. The other part was because I wanted someone to notice the bruises and ask me what happened. I wanted someone to help me, but I didn't want to ask for help. It's been nine years since I was at my worst. It wasn't that long ago, but, less than a decade later and people are talking about suicide and mental illness a lot more than they did when I was 20 years old. Just within the last month, I think great strides have been made in eliminating the stigma. All because of one man. Sir Robert Bryson Hall II. Better known by his stage name — Logic. 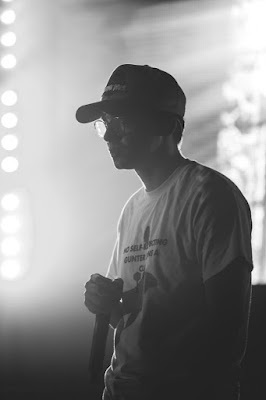 On Aug. 27, Logic performed his hit song 1-800-273-8255 on the 2017 MTV Music Video Awards. On stage, he was joined by more than 30 suicide attempt survivors dressed in white T-shirts with the National Suicide Prevention Lifeline's phone number printed on the front and the words "You are not alone" printed on the back. Since his performance, the crisis line, which Logic named his song after, has seen a 50 percent increase in call volume. The song — which, on Tuesday, became Logic's first ever top 10 hit on the Billboard Hot 100 Chart — is told from the perspective of someone calling the suicide prevention lifeline, saying, "I don't want to be alive." The operator responds, "I want you to be alive. You don't gotta die today," and by the end of the song, the caller changes his mind and says, "I finally want to be alive." In an interview with Genius earlier this year, the Maryland native said he was inspired by fans who told him his music had saved their lives. "In my mind, I was like, 'I wasn't even trying.' Now what could happen if I actually (tried)." "I had to write this. You can't sugar coat it. ... I've thought about killing myself a bunch of times. But never in my life have I thought about committing the act for real. Hopefully I'm never there, but I know a lot of people who have, a lot of people very near and dear and close to my heart. And, because of that, that also served as inspiration for the song." He said that many people feel like they don't have an outlet to express how they're feeling — like the way 20-year-old me felt. He wants to be that outlet for those who don't know how to show it or those who feel like no one is listening. "This is not permanent, the way you feel. It's okay. Things will get better." If you want to die and you don't know who to turn to — please just call 1-800-273-8255. Let someone help you. Let someone talk you out of it. Because you don't have to die today. So many of us want you to be alive.